The contest is open to any high school senior students who live in Laredo and are enrolled during the 2014-2015 school year and will be attending a college/university in the fall of 2015. Submissions must be made by individual students, not classes or other group of students. Use white paper or poster board, size 11x17. All media art form allowed, such as markers, colored pencils and paint. Newspaper clippings, glitter, copyrighted material and digital art is not allowed. For contest rules and regulations, entry forms may be picked up with high school art teachers or at the El Metro Administration Office, 1301 Farragut, 3rd Floor. 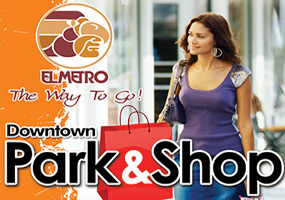 Forms will also be available online at www.elmetrotransit.com. WHAT DO I HAVE TO DESIGN? Participants will design a wrap(an advertisement that covers from wheel to wheel below the bus window: rectangular in shape) promoting public transit. 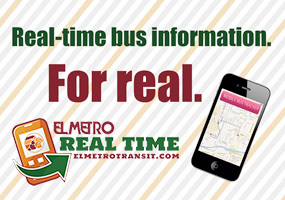 Public transportation reduces gasoline consumption. How will all the entries be judged? Entries will be judged by a panel consisting of transit staff members, city officials, Hachar Media staff, and high school /college administrators. The scholarship winners will be announced in October 2014. Hachar Media Advertising will be awarding two scholarships in the amount of $1,000 per high school district. 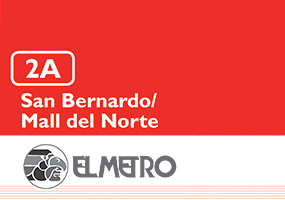 The artwork designs will be used to wrap an El Metro bus, which will be unveiled in October 2014. The wrap will remain on the bus for one year. Winners will also be honored at a City of Laredo Council meeting and will have their artwork featured on an El Metro bus and news releases.